Leeds, UK, 10 April 2014 – North Yorkshire Timber is one of the largest independent timber importers and merchants in the North East. Their dynamic business offers products for everyone, from large construction companies down to the general public. To support their constantly growing customer base, the company’s senior management were keen to modernise their logistic systems. They needed a system that could match the scale of their operation and leave room for continuous growth. 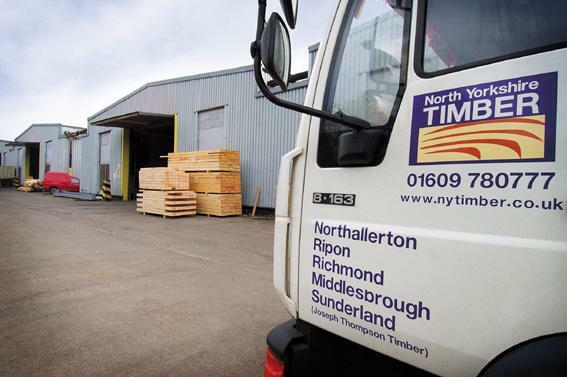 explained Gordon Bache, the distribution and warehouse manager at North Yorkshire Timber. North Yorkshire Timber served as a pioneer – they were one of the first few companies to try out the newly developed JobWatch system. They initially ran a trial with only 2 vehicles. Almost overnight, the firm began to realise significant improvements in their operations. explained Bache. The tangible benefits were clear and they decided to roll out the system to their entire fleet. • Reduction in customer calls as the teams previously spent up to half the day answering calls to track the progress of orders. Now, each of the depots has access to the JobWatch system and can see the progress of a delivery for themselves. • Customers also receive an automatic text updating them on the ETA of their delivery. • JobWatch helped identify the savings they were making and enabled them to purchase another truck.